Looking for a quality used dinghy? Want help finding the correct dinghy for you? Looking to sell your dinghy? Ian Jubb and Pete Vincent are the people behind the business. Between them they have massive experience in the dinghy marine trade. They have also sailed competitively in a range of different classes for many years in both the UK and abroad. There are not many people in the dinghy world who have not heard of Ian and Pete; and there are not many sailing clubs in Britain they have not visited. Ian has extensive practical knowledge of sailing dinghies, and also runs the very successful sailboatdeliveries - which delivers boats all over Europe. He also has vast experience racing trapeze boats. Ian and Pete run a company specialising in refurbishing second hand boats, the majority are 1-4 year old boats from Minorca Sailing Holidays predominately from the Laser and RS range. This has led them to part exchange many older boats and provide a wider choice of boats. They have built up a very strong reputation in the last 10 years for supplying quality second hand boats to suit the package the customer is looking for. Many boats are sold into Europe: particularly Lasers to Norway, Sweden, Germany, Holland, Italy, Ireland and Spain. Delivery and shipping can often be arranged using contacts all across Europe. - Free advice. Using their encyclopedic knowledge of the second hand market and dinghy sailing Ian and Pete can provide a service for many people new to sailing to help them find the right second hand boat for their purposes and to suit their budget. They are not dealers for any specific range of boats and hence can offer truely independent advice. Ian and Pete realised a long time ago that by getting people into the right boat for them creates life long sailing fans and on going customers. - Brokerage. Ian and Pete sell many boats privately providing a successful and hassle free brokerage service. 2nd handdinghies.com is now part of that service. - A high degree of flexibility is offered with any package advertised - if you want more sails, a road trailer, different covers or parts then just ask and the package can be adapted to suit your requirements (the price may vary accordingly). - Second hand sails and spars. There is always a wide range of second hand sails and spars available. - Boat repairing. 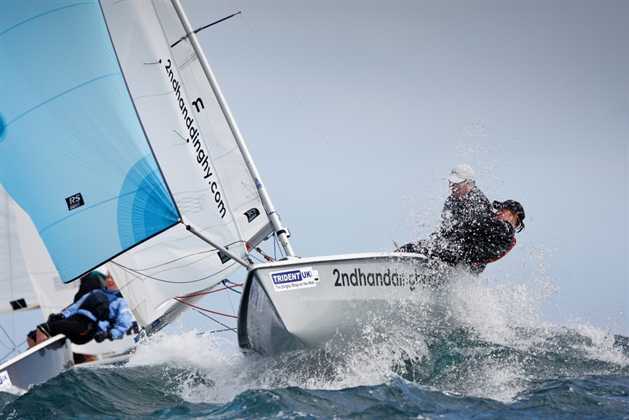 Two Insurance approved repair centres who are specialist in sailing dinghies. SEE Coaching page for details of Minorca Sailing Holidays Race Week starting JUNE 24th with Pete coaching asymmetrics for a week; the ideal way to improve your racing. © Copyright 2nd Hand Dinghies 2019. All rights reserved.